Precise Cam Timing With No HP Loss! Even though Milodon Gear Drives are designed for ''All Out Competition'', they work equally well in any application, including street. When installed properly, these units will virtually last indefinitely due to the wear and their overall brute strength. Cam timing accuracy and consistency are the key to accessing 100% of the cam's available power. A timing chain or an ''easy to install'' $150 gear drive unit can not provide this. Milodon's professionally proven ''Fixed Idler Gear'' system is capable of maintaining the precise cam timing required to allow the release of this power. 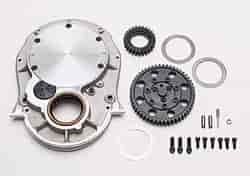 Cam timing adjustments are effortless to perform via the two piece cam gear and cam hub assembly that is accessible on the Full Cover Style Assembly through the removable billet cam cover. The adjustment is achieved by changing the position of the cam gear on the cam hub. A simple bolt-on procedure with no offset dowels or keys to mess with. Each movement is detailed on a provided chart which gives the exact position for the desired amount of advance or retard, once top dead center is found. A professional style three gear unit, unlike a four gear type, does not rob any power from the engine to run. The billet steel gears mounted solidly to the block, will not and can not, allow the timing to vary, unlike a flexible belt or chain. These factors add up to increased horsepower output and higher RPM potential.